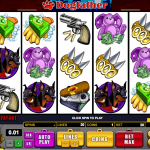 Dogfather is a video slot game coming from Microgaming which has a mobster theme. But the twist is that the classic mobster symbols are replaced with dog symbols. Still they are tough and fierce as any mobster so you don’t want to get on their bad side. Everything in the slot revolves around the Dogfather and he’s the dog you want to see if you need something done. The symbols in the slot are well designed and attractive and will catch your attention at first sight. The wild symbol in the slot is the Dogfather himself and he will substitute for all of the game symbols except the scatter and the bonus symbol. He also comes with a hefty 13.000 coins payout if five of them land on an active pay line. The scatter symbol in the slot is Itchy the Flea. If you manage to land 3, 4 or 5 fleas across the reels you will trigger the free spins bonus. During the feature all payouts will be tripled in size and the free spins bonus can be re-triggered. You can also trigger the bonus round during the free spins but the payouts will not be tripled in size. The Mark Your Territory Bonus is triggered with 3, 4 or 5 Hydrants scattered across the reels. In this feature you will need to make picks among 13 hydrants. Each of them will reveal a coin prize and you can make as many picks as the number of triggering bonus symbols. The maximum payout in this feature is set at 5.300 coins. Mobster slots are always interesting and when you add dogs to the equation the result is amazing. 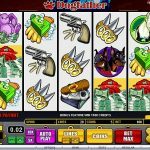 Dogfather is a great Microgaming slot which has a lot to offer in terms of bonus features and game play. All you need to do is try the game for real play and hope that the Dogfather will reward your loyalty. What can be better than playing slots based on dinosaurs? Exactly, so play Dino Might a 5 reel slot by MicroGaming.